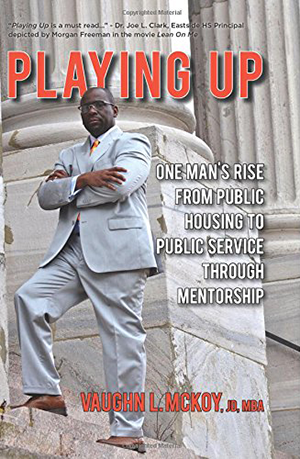 In his enthusiastically received autobiography Playing Up, the former college football standout and federal prosecutor takes the reader on his inspirational journey through the unforgiving streets Paterson, NJ and Eastside High School (subject of the 1989 hit movie Lean on Me starring Morgan Freeman as the controversial, bat-wielding Principal Joe L. Clark) to high-powered positions in law, government and business. Despite challenges, Vaughn excelled through resiliency and the conviction of supporters. Playing Up can be found on VaughnMcKoy.com as well as on Amazon.com, Kindle, Nook and BarnesandNoble.com. Other projects include Playing Up: The Coaches’ Playbook and Teaching Resources, an academic companion to Playing Up, and the soon-to-be released allegory Rookie: 12 Keys for Mentees to Build Successful Mentoring Relationships. In addition, Vaughn has written articles that have been published byThe American Management Association, Madame Noir, and The Garland Journal, and he is a “mentorship” blogger for CEO Magazine.